Jungle Red Writers: What We're Writing--Rhys goes to the palace. RHYS BOWEN: I'm in the early stages of a new Royal Spyness book, this one with the working title ON HER MAJESTY'S FRIGHTFULLY SECRET SERVICE. What do you think about the title? Like it? As in several of the books Georgie is sent on an assignment by Queen Mary. 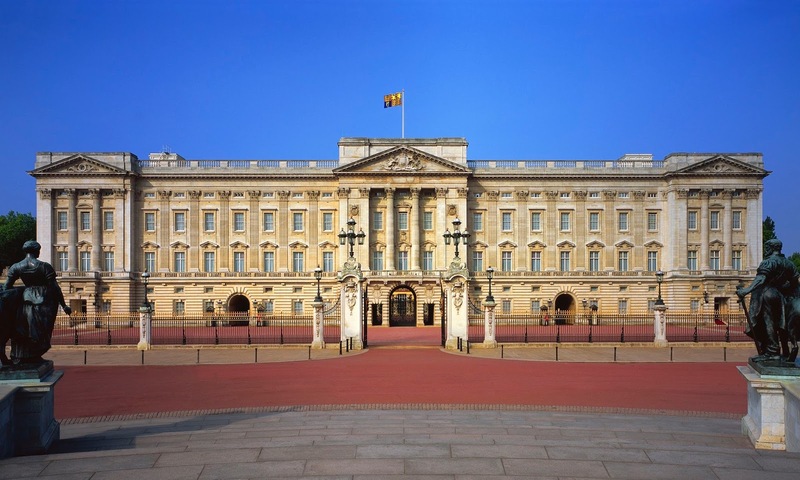 And this usually involves going to Buckingham Palace--always worrying for Georgie as she tends to be clumsy and hates to find herself surrounded by priceless antiques, or having to eat in the queen's presence. When I did a tour of Buckingham Palace a few years ago I enjoyed myself thinking "Georgie might have knocked over this statue!" But her concerns about having tea with the queen come from personal experience. When I was a young woman I had tea with the present queen. Oh-- the worry about knocking over a tea cup on the pristine white cloth! Or of biting into an eclair and squirting cream onto the queen's silk dress! Luckily that never happened as we were instructed before the meal that one only eats what the queen eats. And the queen ate one piece of brown bread. So the rest of us stared at the table, laden with every type of delicious cake, scone, tart, and each of us chewed brown bread one hundred times. From Georgie's Diary: Off to Buckingham Palace to have tea with the queen in a few minutes. How grand that sounds and how easy it is to write it! But golly, I’m always a bundle of nerves, even if she is a relative. Please don’t let me knock over any statues or Ming vases! At three o’clock it was still raining hard and a fierce wind was driving the rain almost horizontally, making me reject the fur coat with regret. Not wanting to arrive at the palace looking too much like a drowned hedgehog, I decided to throw caution to the winds and hail a taxi cab. “Where to, love?” he asked as I climbed into the back seat. “Buckingham Palace, please,” I said. “Actually I am,” I said. We drove around Hyde Park Corner and down Constitution Hill. “So where do you want to be dropped off, yer highness?” he asked. “What, one of their own family? We’ll see about that,” he said and turned into the front entrance, between those imposing gilded gates. Guards stood on either side, with rain streaming down their faces and running down their bearskins while they looked stoically straight ahead. Until we pulled up, that was. One of them stepped out, gun at the ready. The guard bent to peer at me. “And you are, miss?” he asked. “Thank you!” I beamed at the guard. He stood back at attention, but allowed himself the glimmer of a grin. So we swept into the central courtyard and a footman came out to open the door for me. He looked surprised at the cab. “Lady Georgiana to see her majesty,” I said. I'm not one of those writers who outline so I have only the vaguest idea of what this assignment will bring Georgie. I know where she is going-- to the Italian lakes. I know who is going to be killed and why, but not sure yet whodunit. Or what Georgie's role will be. I just turn her loose and follow along and things usually start to happen. Let's hope they will this time! What a sweet scene . . . the cab driver and the guard both made me smile. Thanks for giving us a glimpse into Georgie’s new adventure. Tea with the Queen . . . one can only imagine how exciting and special that must be! I love the fun in this scene! Please, though, you must tell us how you came to have lunch with the Queen! How old were you and how many people were there? Sounds like another fantastic story in the making. Even though you say you don't know where you're going you seem incredibly surefooted, Rhys. We will all be on the journey with Georgie, and we know from experience that it will be fun! I love this excerpt Rhys--the cabby sounds so very real! What a disappointment about the brown bread. Makes me scratch my head--why in the world put all that other yummy stuff out, and who in the world eats it later? Georgie is always getting herself into trouble. Not sure what I think of the title yet though. It's a bit long and of course, does call to mind the Bond film. I get why that is appropriate (in a funny sort of way), but I think it is the length of the title that is throwing me. The other titles have always been short and pithy and this one is very different. I'll have to live with it for a while and maybe the cover design can win me over. When you write, do you just zoom along? I am loathe to ask you how you do it---but how? Seriously. I love the cabbie and the guard. And yes, that cabbie will brag about this for a long, long time! Brown bread? Really? I'm with Lucy - why bother to put out all the yummy stuff if all you get is brown bread? Yes. Who gets to eat all the "not brown bread"? Love that scene. And the cabbie. I am champing at the bit for the next Georgie adventure. Georgie always makes us root for her, and apparently, the other characters do, as well. Love the cabbie being so protective. I also want to know why you were dining with the Queen. 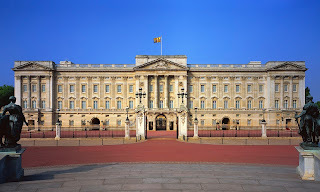 I've been to Buckingham Palace, but only outside the gates, and with my mother and a couple hundred other tourists. What a melee. Karen--I had tea with the queen at my college when I was a student body leader. She came to open a new building and I was one of 6 students who were chosen to have tea with her. It was a great eperience, just 6 of us and the queen around a tea table. Hank, I really do hear voices in my head! Please don't report this to the authorities. When a character comes to me the first thing I hear is how they speak. Once I've got that dialog nailed then that person is real to me. I think that's why Georgie and Molly both work so well for me. They just spoke to me and there they were. An expercise I suggest for students is to write a paragraph first person for any character they are creating. They will be surprised how real that person suddenly becomes. Rhys, I love the title! And I agree with everyone about the brown bread. But now we know how the queen looks so good. Imagine if she ate all the goodies every time she's required to have tea! I love the cabbie, I love how easy and natural Georgie's voice is. We're always happy to go along wherever her adventure's take her. I've never written in first person except for the short story for the upcoming Laurie R. King/Les Klinger Holmes anthology, but that was so much fun! I'm going to try your suggestion for writing a paragraph from each character in first person. I do find that when I start writing dialog the characters really pop into life, so I suppose that's close to the same thing. Georgie is such a sweetheart. It's no wonder cabbies and guards look after her! I suspect the palace kitchen has a wonderful tea every afternoon with the leftovers. Is Darcy going to pop up in Italy too? And more important, did they make it to Gretna Green? Oh, I love this scene, Rhys. Georgie, always so unassuming, gets some sweet treatment from the cabbie and the guard. Our Georgie is special, and it's nice when good fortune smiles on her. I do wish the Queen would give her some clothing and spending allowance when on these trips. Her blindness to Georgie's dire straits irritates me. And, how amazing to have actually had tea with the Queen, Rhys. Why do tea attendees have to eat only what the Queen does? I know this is a rule, but I still don't understand it. Do you have any pictures of your tea, Rhys? The title? I said it several times to myself, and I really like the "Her Majesty's Frightfully Secret Service," but the "On" in front bothers me. For me, leaving off the "On" creates a better flow. Of course, the flow of the book will be perfect, as always. Things must have changed at the Queens afternoon teas. A good friend of mine was invited with others to tea two years ago.lots of goodies, which all nibbled at. However, the flunkies moved in as Her Majesty prepared to leave. All were discreetly jostled from the room, leaving whatever they were eating on their napkins..,no doggy bags at the palace! I wondered about the brown bread too. Thanks for clarifying that, Rhys! In the past month I've gotten to catch up on many books in the TBR pile, including NAUGHTY IN NICE (which my dh got a kick out of the title) and THE EDGE OF DREAMS. Have so enjoyed the cool, rainy days where I can sneak in some reading! Love your breezy outlook on writing and on life!!! Tea with QEII, now that is a great life moment. I was once invited to be in the Smithsonian Museum when the Queen visited during the US bicentennial. So exciting, right!! We were all gathered in a room that held an exhibit, and were told to stand behind the velvet rope and NOT SAY A WORD while Her Highness walked up and down the room, never glancing in our direction! My only claim to royal fame… I once interviewed Prince Charles! What about Darcy? Do they finally get married? !